Eric Carle and his late wife Barbara established The Eric Carle Museum of Picture Book Art in November 2002 in Amherst, Massachusetts. Inspired by picture book museums they toured while on trips to Japan, the Carles set out to create a museum in the United States that would celebrate picture books and picture book illustration from around the world. They chose Western Massachusetts, their home for many years. Eric Carle is the acclaimed creator of picture books for very young children. He has illustrated more than 70 books, and sold more than 110 million copies. His best-known work, The Very Hungry Caterpillar, has been translated into more than 50 languages and sold more than 33 million copies since it was first published in 1969. Eric Carle was born in 1929 in Syracuse, New York, the son of German immigrants. His parents moved the family back to Germany when Eric was only six years old. He graduated from the prestigious art school, the Akademie der bildenden Künste, in Stuttgart. Eric returned to America in 1952 and landed his first job in New York as a graphic designer in the promotion department of The New York Times. Later, he became the art director of an advertising agency. Educator and author Bill Martin Jr, asked Carle to illustrate a story he had written, Brown Bear, Brown Bear, What Do You See? Taken with children’s book illustration, Carle went on to create his own book, 1,2,3 to the Zoo, followed by The Very Hungry Caterpillar. Eric Carle’s original art is regularly on view at The Eric Carle Museum of Picture Book Art and on tour at museums around the world. His collage is instantly recognizable, created from hand-painted papers, which he cuts and layers to form boldly colored images. This technique has become a favorite activity in classrooms everywhere, and is regularly offered as an activity in The Carle’s Art Studio. 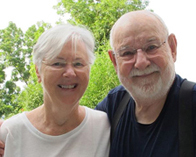 Eric Carle and Barbara Morrison, an early childhood educator, married in 1973. Eric Carle has two grown-up children, a son and a daughter. In 2004, he and Barbara retired to Florida and North Carolina. Barbara Carle passed away on September 7, 2015. Her passion for the arts and the welfare of children lives on through the Museum. To learn more about Eric Carle and his books, visit The Official Eric Carle Website.